“SOON TO BE A MAJOR MOTION PICTURE” – with Matt Damon no less. This book was on my “to-read” list even before I started seeing the trailer on the internet and on TV. Now that the movie is coming out shortly (October 2015) I figured I’d better get on with reading it. Good choice. As someone who reads a LOT of science fiction and fantasy (sometimes as many as 3 books at a time – one for bedside, one for the daily train into work, and one audiobook for the car), I can honestly say this was one of the most readable examples of the genre I have come across in a long time. I gave a copy of this book to my college student daughter who is majoring in chemical engineering, because the gist of the book is that science is cool, and not only is it cool, it can save your life. The Martian tells the tale of Mark Watney, an American astronaut who is inadvertently left for dead on Mars by his crewmates on the 3rd manned mission to Mars. 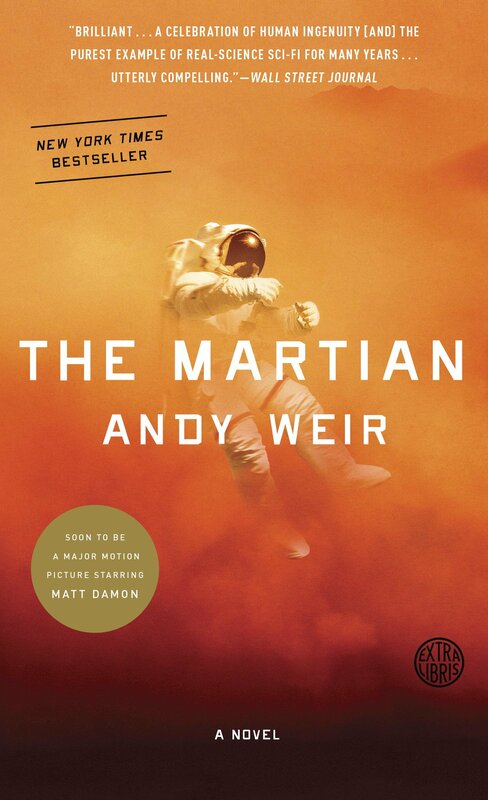 So as to avoid too many plot spoilers before you see the movie, I will tell you only that the novel is about how Watney uses his scientific knowledge (particularly his knowledge of chemistry) to stay alive on Mars until such time as a rescue mission can reach him. Many books written by writers who are A) real scientists, or B) writers with a science background, can be way over the heads of those of us who lean more towards the creative, or “soft skills” side. Refreshingly, in this one, the science is presented to the layman in a very understandable fashion. Not only that but this book is FUNNY, as in John Scalzi snarky humor. I had to constantly remind myself that this was not a Scalzi book or blog post. Having viewed the trailers several times, I only see one instance where they embellished the book, it’s that good, as in it needed no embellishment. I plan to see the movie, I would encourage even the most casual sci-fi fan to both read the book and see the movie, I most definitely plan to do the latter after having done the former. This was one of those books where as you read, you are visualizing what the movie would look like. Without having seen the movie, I will say if it is anywhere close to the book, it will be a must-see for 2015.